It’s safe to say that Wells Bring Hope is charitable. But I don’t think charity is the best word to describe what’s being done. Charity is akin to pity, to feel sorry for someone. While pity can be benevolent, it can also stem from negative perceptions. When you take pity on someone, you’re regarding them as less than, as separate. You have something the other person lacks, and their existence must be less because of it. In this frame of mind, the other person is a victim. When someone is labeled a victim, they may feel defined by that label, stuck in whatever circumstance life put them in. So on one side is the victim, and on the other is the hero, an archetypal story playing out through countless charities. 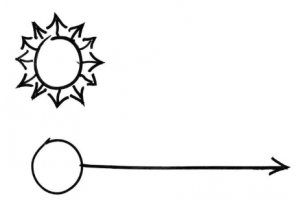 Big change doesn’t happen through charity, but through solidarity—unity in feeling or action. Change happens when we recognize that everyone has wisdom and resources to make the world better, including those who receive “charity.” This mindset is more respectful because the recipients have a say in the solution. It’s not about giving handouts and expecting nothing. Wells aren’t handouts. 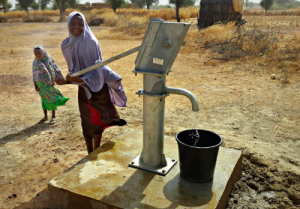 Wells Bring Hope isn’t just giving rural villages water; it’s giving them a resource. With it, the villagers can work more productively to improve their own lives. With the microfinance program and drip-farming workshops, women have built their own businesses, which provide them with money they can use for food, healthcare, and education for their children. This kind of impact ripples through generations, changing the world. Global solidarity is already apparent in Niger’s giraffe conservation and in efforts to harbor and support refugees. They have the ability and the desire to do great things; many only need resources, knowledge, or encouragement. By drilling wells, Wells Bring Hope is sharing a resource that will help others to do their part. Of course, compassion is also key to solidarity. Empathy is not enough. I can search for a point of commonality between my air-conditioned life and the life of a Nigerien woman who has to walk miles for water. But I’ve never been in her shoes, so I can’t claim to really understand her experience. Rather than wallowing in guilt, I can channel my emotions into compassion. When you feel compassion towards someone, their type of suffering doesn’t matter. What matters is that they are suffering. Compassion literally means “to suffer with.” What makes compassion different from pity is shifting from a victim-hero relationship to one of mutuality. I at least recognize what it’s like to be sad and to want help. Even a thousand miles apart, the woman drawing water from a dirty pond and I can nod and hope better for each other. That is where I find my point of commonality. By shifting the mindset from charity to solidarity, it’s easier to see how everyone is important in making a change. To get to where we need to be, we must raise each other up every step of the way. Read Shayna Watson’s post on “doing well by doing good” for an example of this kind of solidarity in action. When we hear about the Sahel in the news, it’s often in connection with a humanitarian crisis. Droughts and other disasters regularly push the region into a state of crisis, and the international community usually responds with a large-scale emergency relief effort. In 2012, USAID recognized that these repeated crises occur because communities in the Sahel lack the capacity to withstand adverse events like droughts. They also recognized that emergency relief efforts, which are essential for saving lives, are expensive and do little to address the chronic vulnerability that lies at the root of the crises. In response, USAID adopted a new approach for development in the Sahel. It’s known as “resilience programming,” and its purpose is to build the capacity of local communities to withstand environmental crises. Resilience programming is based on the theory that creating stronger, healthier, and more economically-diverse communities will lead to fewer crises. 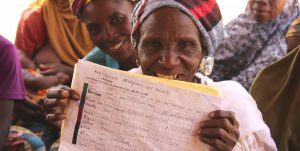 The Resilience in the Sahel Enhanced (RISE) program works with communities in Niger and Burkina Faso. One key objective of the RISE program is to empower women. According to USAID, empowering women is critical to building resilient communities. Although women tend to be worse off than men socially and economically, they often have an immense impact on the well-being of others. Building women’s knowledge and skills, increasing their access to assets such as land and livestock, and promoting female leadership improves the economic and physical well-being of the entire community. For example, when women are given the same access to agricultural resources as men, crop yields increase by 20% to 30%, and children tend to be better nourished. Women’s access to these resources strengthens the community by increasing the food supply and improving health. The RISE program addresses multiple interconnected problems, including chronic poverty, malnutrition, poor health, land degradation, and low agricultural productivity. For example, RISE increases women’s economic engagement by helping them to identify market opportunities, providing the resources and skills needed to take advantage of them, and developing the external systems needed to support them. Since many of the market opportunities are agriculture-based, the project improves economic and physical well-being and helps address ecological problems such as land degradation and low agricultural productivity. In the Maradi region of Niger, RISE helped women create savings and loan associations to finance small business opportunities. One group of women learned how to transform nutrient-rich niebe (black-eyed peas) into products such as porridge, couscous, and flour for pasta and cookies. They now sell the products at regional markets and agricultural fairs organized by USAID and the Nigerien government and use the proceeds to rent more land, grow more niebe, and buy equipment. The women also planted moringa trees, which mature quickly and produce leaves that are high in protein and vitamins. RISE taught them how to harvest, dry, and grind the leaves into a powder to sell as a food supplement for pregnant and nursing women. In other communities, RISE trains women to raise sheep and goats for milk, meat, manure, and leather, as well as for offspring that can be sold or given to others in the community to start their own livestock businesses. RISE also teaches agricultural techniques that increase crop yields, such as making compost to enrich soil. By producing more products and bigger yields, these projects bring more food, more economic growth, and stronger, healthier communities. Perhaps just as importantly, they also bring more hope for a better future. 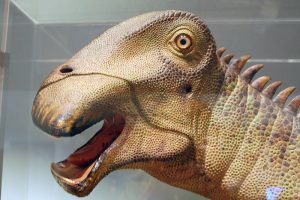 Dinosaur fossils have been discovered on every continent on earth (though of course when dinosaurs roamed, there was still only one supercontinent, Pangaea). There have been numerous fossils found in Africa, including some in Niger. One of the most well-known fossils found was the Nigersaurus, named after the country where it was discovered. The first Nigersaurus fossils were found around 50 years ago in the Erlhaz Formation, located in Niger’s Ténéré Desert. They were discovered in a paleontological expedition led by French paleontologist Philippe Taquet. It was the first expedition of its kind in Niger, and it proved to be very fruitful. Upon studying the fossils, the Nigersaurus was determined to have lived in the Early Cretaceous period, more than 100 million years ago. The Nigersaurus was a rebbachisaurid sauropod (which means it was a long-necked, long-tailed, small-headed dinosaur that walked on four legs and belonged to a family of fossils found in South America, Africa, and Europe). The Nigersaurus was estimated to weigh four tons (about the average weight of an adult elephant) and around nine meters long, which is short for a sauropod. It had a wide, rounded muzzle with 500 teeth that were replaced at an astonishing rate of every 14 days. The blunted muzzle of the Nigersaurus provides a clue on what it ate during the Cretaceous period. The Nigersaurus is often referred to as the Mesozoic Cow since paleontologists believe it often grazed with its head close to the ground. In fact, the Nigersaurus was a megaherbivore, whose diet likely consisted of soft plants, such as ferns, horsetails and flowering plants (grass had not even evolved at that time, and would not have evolved until the Late Cretaceous period). This suggests that back in the Early Cretaceous period, the vegetation of the Ténéré Desert at least included soft plants. Plant fossils found in the region of the Sahara Desert showed the existence of cycads and conifers in the Cretaceous period (though they were unlikely to have been fodder for the Nigersaurus, as they were not at the appropriate height) in addition to ferns. From the evidence of various fossils, it was hypothesized that the Sahara region had greenery and fast river systems millions of years ago. 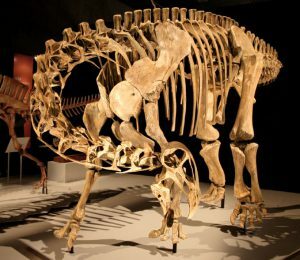 In the same expedition, the fossils of the Lurdusaurus, the Ouranosaurus, and the Elrhazsaurus were also found in the Erlhaz Formation, and all of these dinosaurs were found to be herbivores as well. This further supports the hypothesis that the area had an abundance of greenery. While the structure of a dinosaur skeleton provides information about the environment at the time it was alive, it doesn’t provide much information about the climate. Luckily, we’re able to rely on other types of evidence, such as plant fossils, sediments, and our knowledge of the dinosaurs’ diets to learn about the climate. Paleobotanic evidence shows the probability of episodic droughts and semi-arid climates, which would still allow flowering plants and other soft vegetation to prosper. While it’s certainly interesting to learn what the earth and land used to be like millions of years ago and how it has changed, scientists also believe that gaining an understanding of the environment in the Cretaceous period can help inform our understanding of the process of global warming, which has a direct impact on life today, particularly in drought-prone countries like Niger where people now die not just from drinking contaminated water, but from dehydration as well. To see all the dinosaur fossil discoveries that have occurred around the world, visit the Paleobiology Database. Sereno, P. C., Wilson, J. A., Witmer, L. M., Whitlock, J. A., Maga, A., Ide, O., & Rowe, T. A. (2007). Structural extremes in a Cretaceous dinosaur. PLoS One, 2(11), e1230. Russell, D. A., & Paesler, M. A. (2003). Environments of mid-Cretaceous Saharan dinosaurs. Cretaceous Research, 24(5), 569-588. The phrase “doing well by doing good” has been said many times to express the importance of making an impact with our altruistic actions. Documentaries like “Poverty Inc.” warn us about the dangers of giving to communities in need without allowing them to make a future for themselves. With good intentions, aid programs often displace local merchants with the donation of food and clothing in villages who once had their own goods economy. NGOs are becoming aware of these potential pitfalls and are adapting accordingly by ensuring that locals are involved in the development of long-term, sustainable aid programs that work to build on existing local economies and trade. The Association of Unemployed People, in partnership with USAID, is a local resource that works to give young people in Niger the opportunity to learn trade skills. With unemployment on the rise after a shift in the (local) uranium mining industry, many young people were turning to illegal activity in order to provide for their families. The correlation between the high unemployment rate, mortality rate, and increased crime can be seen in countries throughout the world. In 2016, the association, with support from international aid initiatives, was able to refurbish sewing machines and secure training so Nigerien youth could learn to sew traditional clothing as a trade. Young adults who may have otherwise suffered from the decline in employment opportunities are able to take advantage of the two-year training program that includes sewing, knitting, and current events discussions. 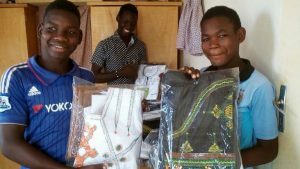 Students of the program are able to sell their clothing in the studio’s boutique and also take their talents back to their village to teach others. Before the revitalization of the studio, only women were trained to sew in most villages. After the revamp, both women and men (ranging in age from 14-27) are able to take part in the training curriculum, and gain a very valuable skill set to provide for themselves and their families. The surrounding communities have shown support and excitement for the growing program, with many tailors hiring students from the studio to help in their shops. The positive effects of building sustainable opportunities for communities plagued with poverty and terroristic threats can be seen on both the smaller and larger scales in the change it has brought to the Agadez region of Niger. In addition to the trade program, community cohesion initiatives have worked to aid local citizens in detecting, preventing, and responding to threats of violence with awareness training and workshops. These programs hope to empower local organizations to identify at-risk youths, connect them to programs, and advocate for their needs and concerns. With the inaugural class of students graduating from the two-year program, the sewing studio is still flourishing and even has a waitlist of young adults hoping to join future classes. The citizens of Agadez will hopefully continue to feel the social impact of a program that focuses on addressing financial, social, and emotional needs in their local and worldwide communities. On June 20, 2018, the world honored millions of refugees for World Refugee Day. Along with their bravery and resilience, I also want to honor Niger, one of the countries that has given refugees hope for a new life. To understand Niger’s role, we first need to understand the refugee crisis in Sub-Saharan Africa. From Mali and Chad, Cameroon and Libya, hundreds of thousands of women, men, and children have fled the ruins of their homes and the threat of death. Many cross through Agadez, Niger on their way to Libya and on to the Mediterranean Sea where they board tightly packed smuggler boats bound for the safety of Europe. Some never make it to the sea, caught by traffickers, rapists, or ransomers on the long trek. Those who do make it to the coast then begin the most dangerous part of the journey. In 2017, over 3,000 migrants drowned when their boats capsized in the Mediterranean Sea. These tragedies are increasing as more European ports close to migrants, leaving them stranded on the waters. 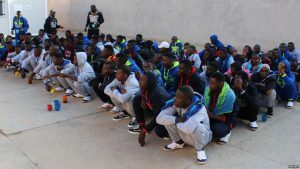 The Libyan Coast Guard often sends boats out to bring them back to shore, but then they’re then held in detention centers where some remain for years. This is where Niger comes in, seeking out refugees in Libyan detention centers and on their long journeys north. The UN Relief Agency resettles the refugees most at risk, either in Niger with host families, or in a resettlement location in another country. After resettling 122 refugees in Niger, the UN High Commissioner for Refugees, Filippo Grandi, praised the nation: “One of the poorest countries is also one of the most generous. It has security issues, economic problems, and a complex neighborhood, but it has always kept its borders open.” Like a lifeboat in a tumultuous sea, Niger is often surrounded by conflict. Despite its limited resources, it continues to reach out and pull these desperate refugees to safety. Nevertheless, the number of refugees and asylum-seekers coming to Niger is increasing, and with limited resources, Niger is struggling to keep up. It had to suspend refugee resettlement operations for two months because too few countries would accept them. In addition, many of the Nigerien communities that integrate refugees are extremely underdeveloped and lacking in resources. As Wells Bring Hope continues to drill wells, rural villages will be more equipped to help. Migrants suffer through unimaginable pain and loss, through heat, hunger, and absolute uncertainty—that anyone should have to walk miles for uncontaminated water is heart-wrenching. As Niger continues to keep its borders open, I hope it will serve as an example to the rest of the world, that even in great need, we can offer hope to millions of people just looking for something to hold on to. People – We are determined to end poverty and hunger, in all their forms and dimensions, and to ensure that all human beings can fulfill their potential in dignity and equality and in a healthy environment. Peace – We are determined to foster peaceful, just, and inclusive societies which are free from fear and violence. There can be no sustainable development without peace and no peace without sustainable development. The agenda in total lists 169 targets in 17 goal areas. While I can’t help but feel inspired by the lofty goals of the U.N.’s agenda, it is hard to feel empowered to help as an individual when their objectives are so numerous and widespread. I worry that the lack of focus and prioritization will end up preventing them from being as effective as possible. I can’t help but wonder if the U.N.’s resources were focused on one priority, like solving access to clean water, what might be accomplished and how quickly? Essentialism helped justify my continued support of the mission of Wells Bring Hope, which focuses strictly on solving the water crisis in Niger, the world’s poorest country. It does not try to fix every issue. Wells Bring Hope determined their priority, and how they could make their greatest contribution to solving that problem. This year, Wells Bring Hope was proud to announce that over 500 wells have been funded, transforming the lives and communities of those most in need. If you are reading this and considering donating, I hope this comforts you. I believe that a small organization like Wells Bring Hope can have a huge impact, simply based on their focus and sense of purpose. In the past 30 years, Africa’s giraffe population has been reduced by 40% due to habitat loss, poaching, and civil unrest. In some areas, it has plummeted by more than 80% bringing some giraffe species close to extinction. The future looks bleak for many of Africa’s giraffes. But in Niger, home of the West African giraffe, a different story is unfolding. Giraffes are making a comeback thanks to a conservation strategy that has the government, conservation groups, and local communities working together to save them. A hundred years ago, West African giraffes numbered in the thousands and their habitat stretched from the coast of Senegal to the middle of Africa. By 1996, the population had been decimated. Only 49 giraffes remained, and their habitat had shrunk to one small part of Niger. The West African giraffe looked certain to disappear forever. Under pressure from conservation groups, Niger became the first country in Africa to adopt a National Giraffe Conservation Strategy. Other African countries and the wider international communities have been slow to respond to the plight of the giraffe, in part because of a public misperception that the iconic animal is “everywhere” in Africa. 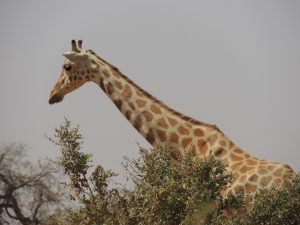 Niger was the first country to recognize the severity of the threats facing giraffes and its conservation strategy has been remarkably successful. Today, there are more than 600 West African giraffes in Niger. Niger’s conservation strategy was three-pronged. The government passed, and actually enforced, strict laws forbidding hunting and imposing jail terms and large fines for poaching. 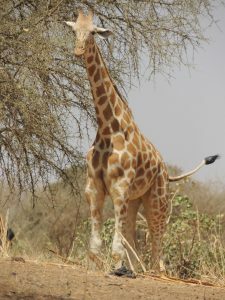 Recognizing the potential importance of ecotourism to Niger’s economy, the government also allocated resources to promoting giraffe-based ecotourism. Most importantly, the government also took steps to resolve ongoing conflicts between giraffes and local communities. This has been a key factor in the success of Niger’s conservation policy because it has brought local communities into the conservation effort and given them a stake in the outcome. Most of Africa’s giraffes live in protected areas far from human activity. But Niger’s giraffes live on community lands alongside farmers, villagers, and nomadic herders, and they have to compete with people for scarce resources, such as trees and water. Giraffes eat 75 to 125 pounds of leaves per day; when people cut trees for firewood or to plant crops, the giraffes’ natural food source disappears and they must find other food to survive, which often means raiding fields and eating crops. Giraffes also get most of their water from leaves; without trees, they must compete with people for other water sources, such as lakes and rivers. The government tried to solve these problems by banning woodcutting in the giraffe zone, but people ignored the law because they needed firewood. Better solutions were required. 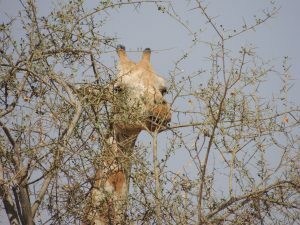 The government and conservation groups have adopted a variety of solutions designed to provide viable alternatives to woodcutting, poaching, and other activities that harm giraffes. To reduce deforestation and preserve water sources for giraffes, they provide free firewood and drill wells for local communities. To reduce poaching, they bring local people into the conservation effort to assist with protecting giraffes, including training local guides to track the giraffes’ locations and behaviors. They also educate local communities on the cultural and economic importance of the giraffe, provide strategies for avoiding human-giraffe conflict, and create local committees to resolve conflict. Because of Niger’s conservation efforts, local communities view giraffes as bringing aid, development, and eco-tourism to the region rather than as a threat to their livelihoods. The future of the West African giraffe is still far from guaranteed, but Niger’s success has made it a model for other countries, such as Kenya and Uganda, which are now developing their own national giraffe conservation strategies. March 22nd, 2018 was World Water Day, but not everyone observed it. Among those who didn’t celebrate were the people of Cameroon who are suffering from frequent water cuts which means the water is turned off and stops running. As a result, water is not easily accessible. Schools in Cameroon are particularly affected by the water shortage. When this occurs, the government shuts off the water so they can’t access it easily. They must trek far and carry gallons of water. Buea School for the Deaf is just one example. Located near the mountains of southern Cameroon, the school operates from Monday to Friday, but some students remain over the weekend if their commute is too far. The school is nestled amid beautiful mountains and trees. It almost seems an ironic background for such a serious crisis. For those who have to stay for the weekends, it is hard to leave the school in search of water as the school is located a few miles up a mountain. There is occasionally running water however the government shuts it off often to conserve it. When this occurs is not predictable to them. Also, some students are as young as 5 years old and not strong enough to carry water. They have 1 employee who remains with the students on the weekends to watch over them. This affects the students because they require water to cook. Without the ability to cook, they struggle to eat. Cameroon plans to solve the crisis by tapping into the largest river, the Sanaga, This is especially helpful for those who remain in the dorms on the weekends because they cannot go home to eat with the family. They completely rely on the school’s supply of water and food which is often limited. Yaounde, the capital of Cameroon, has a population of over three million. Residents need a daily supply of about 300,000 cubic meters of pipe-borne water, but just 35 percent of it is supplied by the city. People have resorted to unsafe sources to get the precious liquid. Some must rely on rainfall. Most cannot afford the cost of a water bottle which is normally 5 cents for 1.5 liters. Cameroon has plans to help solve the crisis by tapping into the largest river, the Sanaga, which is 600 kilometers in length. It will increase the water supply. This would help thousands of people access more water in the capital of Yaounde. Unfortunately, that is one solution and it is not enough. This water shortage needs to be brought to everyone’s attention. Having the opportunity to teach in Cameroon for one year, I witnessed the water crisis firsthand. I experienced the struggle of finding enough clean water to meet my needs. Children are particularly susceptible to water-borne diseases like cholera, which causes diarrhea that can result in life-threatening dehydration. They are particularly sensitive because they have young immune systems, which aren’t yet developed. With access to clean water, the risk of illness and death drops dramatically. Some 768 million people still do not have access to an improved source of drinking water; 40% of them live in sub-Saharan Africa. There is still a long way to go, but progress is being made. If 100% of people had access to clean water, the number of water-borne diseases and deaths would be close to zero. Clean water is critical to human health. By 2025, 1.8 billion people will be living in countries or regions with absolute water scarcity1. That’s why creating water infrastructures and drilling wells is so important. Everyone deserves access to clean water. Water plays a unique role in our daily lives by providing us the ability to remain healthy and well. Outside of it fulfilling a crucial need, water serves as a symbol of purity, fertility, and rebirth in many cultures. The people of the Niger Delta region have recurring festivals that concentrate on the two great spirits believed to govern the earth – hero people and water people. Folklore from these areas explains that hero people originated from water people, coming from them in order to live with mankind. According to this story, water people are the most powerful spirits and the genesis of man. Many villages hold these celebrations for the enjoyment of the spirits, to honor these great forces and request that the spirits control water levels, increase fish supply, and keeping flooding at bay. 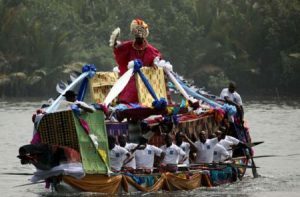 The Kalabari, a tribe of the Ijaw people living in the Western Niger Delta region of Nigeria, hold a four-day festival to honor Duminea, the head water spirit of their village. During this major annual festival, the Kalabari remove a ritual basket from a shrine erected to the water spirit. Designated villagers take the basket on a canoe-guided journey to a small stream dedicated to Duminea. After the traditional religious rituals are completed at the site of the spirit’s rivulet, the rest of the villagers organize elaborate performances dedicated to the water gods that use masks and intricate structures made from material gathered by the river bank. The masks are said to be created according to the wishes of the water spirits and often include fish tails and fins. Dancers from the village perform routines around towering structures, erected to look like humans, with their faces pointing upwards toward the sky to emulate how they believe the spirits are postured while floating around the streams. Priests and priestesses of the village perform dances, often invoking and embodying the important spirits of their village. are then manipulated by dancers to delight the spirits with the hope that they will be generous to the village in the upcoming year. 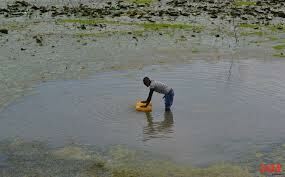 The fishing and agriculture that sustain the Kalabari are dependent on water, so the Kalabari and many other tribes in the Niger Delta region work very hard to please the water spirits they believe control the bounty of their closest water sources. In addition to these religious rituals, people of the Niger Delta region hold many celebrations and jubilant festivals that revolve around water. The annual boat regatta festival includes sailboat races and many days of other water activities. Documentation of these festivals record that villagers can be heard chanting “peace, strength. children, life!” as a call to the spirits of what they hope for their future. Access to clean water affects all aspects of life, and the Kalabari people (and many others) wish for the opportunity to have prosperous lives full of health for them and their children. Over 80% of Niger’s land mass lies in the Sahara Desert, an arid region with an annual rainfall of a few inches or less. All animals on earth require water to survive, but desert animals have evolved the incredible ability to survive in hot, dry climates by making the best use possible out of the limited water supply. Let’s take a look at some of these desert animals and the characteristics they have developed through years of evolution that have allowed them to survive in arid climates. The first desert animal that comes to mind is the camel. Contrary to popular belief, camels do not store water in their humps. Rather, fat is stored in the humps, which allows camels to efficiently regulate their body temperature. The concentrated fat is also useful for the long, grueling days when food is scarce and the extra fat could easily be metabolized for an energy boost. 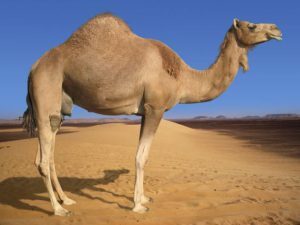 Camels have also evolved the ability to excrete less water in their urine when water is scarce, and to only start sweating when temperatures reach 105ºF, allowing them to conserve more of the water in their bodies for later use. The desert kangaroo rat is a desert animal that makes efficient use of the water they produce through metabolic processes. As their diet, kangaroo rats eat insects and various parts of the plants, including seeds, stems, buds, fruits, and leaves, all of which they could extract water from. 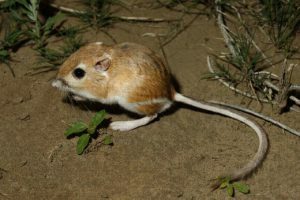 The kangaroo rat’s kidneys are also able to produce concentrated urine, allowing them to rid their bodies of waste without expelling too much water. In addition, desert kangaroo rats have long nasal cavities that help cool the air as it’s being exhaled, allowing it to be condensed into moisture and reabsorbed into the body. All of these body mechanisms allow the kangaroo rat to survive on limited amounts of water. 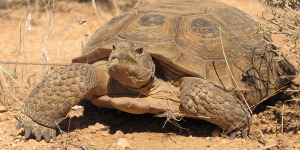 Inactivity prevents water loss, so desert tortoises heavily regulate their activity and body temperature for the purpose of water conservation. They are the most active during rainy seasons and are less active for the remainder of the year. Desert tortoises also try to seek out the optimum habitat for water conservation. Aside from the rock shelters and pallets that they find, desert tortoises are also able to dig burrows for themselves during inactive periods. In addition to being sheltered from extreme weather conditions, the burrows hold moisture that helps tortoises from becoming dehydrated too quickly. Tortoises are also able to water in their bladders, which has permeable walls. During dry seasons, the stored water can be reabsorbed for hydration purposes. Other amphibians like the Australian water-holding frog and the Gila monster have similar characteristics. The thorny devil is native to the sandy areas of Australia and is so named because of the numerous spikes on its head and body. 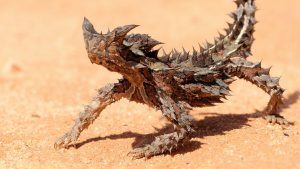 The thorny devil is able to absorb any moisture that comes in contact with its skin via the hygroscopic grooves between the spikes, and the moisture is then drawn into its mouth through the process of capillary action. Just like other desert amphibians, thorny devils lie low in the extremely warm months and the extremely cold months by hiding in underground burrows. While many desert animals are restricted to certain areas because of the availability of clean water, other desert animals are able to travel in search of clean water. Recently, a researcher conducting research in Namibia has found that some bat species residing around the area of the Namib Desert not only travel in search of food, they are also willing to fly great distances to search for high-quality water, in particular, water with low salinity. 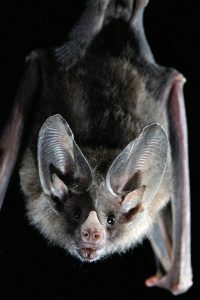 People living in the same area as these bats may take advantage by tracking these bats to find sources of clean water. While we humans have not evolved the ability to use our bodies as water storage, there may be unobtrusive ways for us to take advantage of other animals’ abilities to find fresh, sanitary water. Unfortunately, the continuous change in our planet’s climate is both taking a toll on our natural resources and reducing the number of animal species on earth. The kindness we must have towards our planet and our fellow earth inhabitants are ever more important now in the face of this looming crisis.